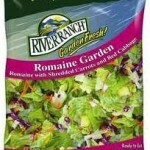 River Ranch Fresh Foods voluntarily recalled packages of shredded iceberg lettuce it distributed in California and Colorado under the brand names River Ranch, Farm Stand, Hy-Vee, Marketside, Shurfresh, The Farmer’s Market, Cross Valley, Fresh n Easy, Promark, and Sysco. The possibly contaminated lettuce has been removed from stores, but the California Department of Public Health said Friday that consumers may have some of the recalled products in their refrigerators. Listeria is an organism that can cause serious and sometimes fatal infections in the elderly, pregnant women, young children, and others with weakened immune systems. Symptoms of listeria infection include high fever, headache, and neck stiffness. What the heck?? Is this getting worse in the last few years or are we just getting better at detecting it? It is a combination of a few things. 1. Better and more immediate media coverage. Listeriosis is the most virulent of the diseases from pathological organisms on the grown for human consumption. It is also the food-borne organism that causes the most deaths: 20% to 30% of people who contract a Listeria infection will die. The CDC reports about 1600 cases of listeriosis occurs each year, and pregnant women carry a 13% higher risk of contracting it. In an outbreak (http://tinyurl.com/6wu5km7) from whole cantaloupes (Jensen Farms, CO), there were 146 people reported becoming ill; of these, 30 died (20.5%). One woman miscarried. The more “sensational” outbreaks will get the most media coverage, which, in turn, produces the most and loudest outcry from humans. This places more pressure on governing bodies, who enact needed regulations. Listeria can survive 0-degree temperature. It has many ways to spread and hijack it’s victim’s resources and systems to survive and multiply. It takes from hours to days to weeks to show up. 2. More stringent regulations, fines for farming practices that put the consumer at risk of infection from pathogens, and liability lawsuits. . The pressure starts with the media coverage; see above, #1. 3. Better testing. . Testing is quicker than it was in the past. See #1 and #2 above. The regulations dictate certain measures that make it difficult for ag crews to work during the hottest part of the day. Therefore, in many situations the ag field work, on hot days, will start in the very early morning hours, or after dusk. While there are regulations regarding the presence of outhouses being present for fieldworkers, when fieldworkers work in the dark hours, limited lighting (just on the part being harvested) is the norm. The supervisors/managers mostly don’t light up the way to the outhouses. To avoid injury from tripping over plants, rows, equipment, etc. in the dark, many workers go off into the dark to take care of their bathroom needs and don’t use the outhouses. It is believed that this has contributed to an increase in food-borne illnesses, which had been in the decline in 2000.